Punch Magazine Cartoons (1841- 2002) were notorious for covering political, social and current topics in interesting and persuasive ways. They published many talented Illustrators and introduced the term ‘cartoon’. The Punch cartoon archive is fascinating and acts as an important document of the years in which they were published. A common feature in all the Punch Cartoons is the humour. The Illustrator relays the message in a funny and subtle way, which relies on the viewer having a basic prior knowledge on the topic. This makes the cartoons very enjoyable to read as the humour takes a while to develop as the subtle joke becomes apparent. An exciting way to discover these illustrations is the Punch Cartoons greetings cards. This is how I have come across my personal favourite Punch Cartoon. 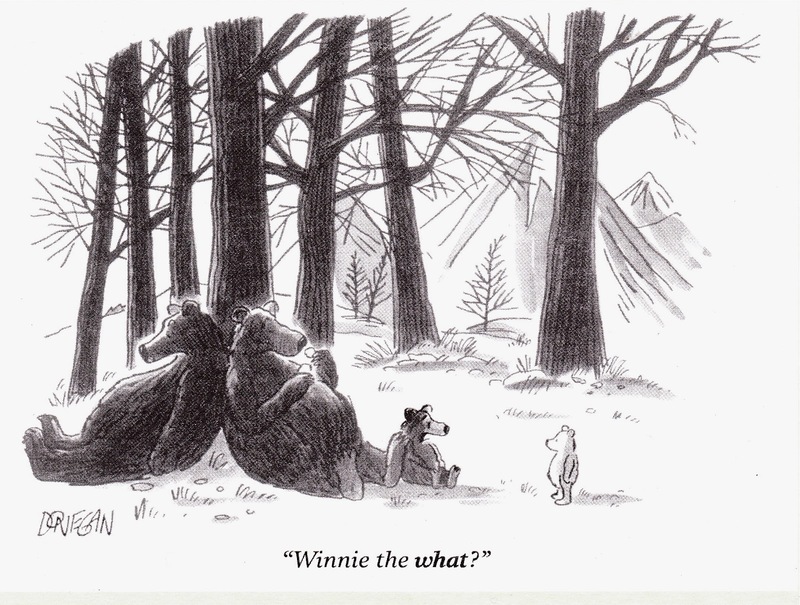 The Cartoon, ‘Winnie the what?’ by John Donegan, was published in 1987. The Illustration shows a family of huge grizzly bears lounging against a tree in a forest. The bear cub is talking to a small teddy bear exclaiming ‘Winnie the what?’. It is now you look at the little white bear more closely and make the connection that he is actually Winnie the Pooh. This cartoon is poking fun at the funny name of A.A Milnes bear, and requires the reader to have that knowledge. The drawing is done in ink and pencil and has a very quiet mood. This is created by using no colours, and the sleepy positions of the bears. There is very little movement in the illustration which adds to the awkward humour of Winnie being questioned about his name. The composition and tone also reads well, left to right. You first look at the dark grizzly bears on the left, then to the text. Once reading the question you then look at the small pale bear, and making the connection of Winnie the Pooh, laugh. The use of light and dark to portray the characters is done cleverly. The big grizzly bears being dark and scratchy make them seem wild and rough. On the other hand Winnie the Pooh looks angelic and innocent as he is small and pale in comparison. The curving shape of the frame leads the viewer’s eye around the illustration in the correct order too. This is a very successful cartoon which makes a very funny and sweet greetings card. The pacing of the humour is crucial to this cartoons charm and the illustration sets this pace perfectly. Previous Post Basic and Sumberac’s ‘Snow White’. I want to buy the card subtitled “Winnie the what?” I cannot see anything on the page to enable me to do so. All I want to do is to buy this card !!! It’s a good one for the wall! !